I have to admit, I LOVE bread! It’s a downfall and I can’t help myself, and I love a good crusty sourdough bread. I have been making homemade breads for years and have been making dozens of different types of breads, cakes, pancakes and more out of my sourdough starter for several years. Here’s my Sourdough Bread Recipe, enjoy! This process takes awhile, not so much of YOUR time, but resting time. ball, then add another 1/4 cup of water and knead another minute or so. knead for another minute or two. during rise. Cover the bowl with a kitchen towel and set in a warm place. I typically put it on my stove top (burners off, of course) and if you have a microwave above your stove top turn the microwave light under the microwave to provide a little warmth. Let is rest for about 4-5 hours or so. plastic wrap and punch the dough down with a single punch. Turn the dough onto a floured board and sprinkle the top of the dough as well. to the surface add a little more flour. dough ball to seal the seams. 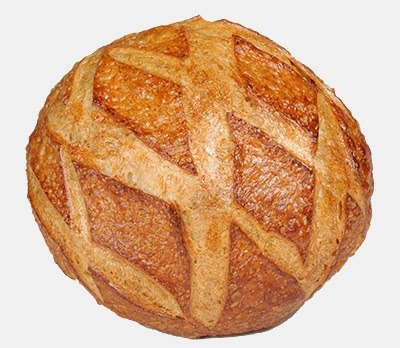 If you have a bread baker, place the dough in the bottom and cover with the lid and place in a warm place again. If you don’t have a bread baker, you can put it on a cookie sheet, and cover with a towel. Allow to rise about 3-4 more hours, until it has about doubled in size. dish and place in the center of the oven. Tip: If you do not have a baker, you can spray the top of the bread with water and put a pan of water on the rack below the bread in the oven to help provide steam for crustiness. turns a dark, golden brown. Move the loaf to a cooling rack and let it cool at least 30 minutes. ENJOY! This entry was posted in Uncategorized and tagged Bread Recipes by Debbie Reynolds. Bookmark the permalink.